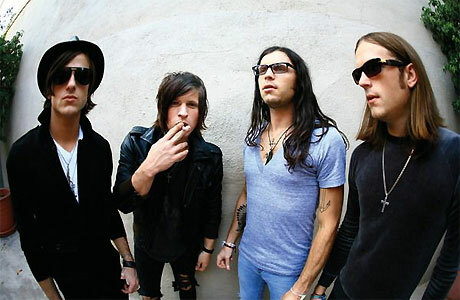 The American band - comprised of brothers Jared, Caleb and Nathan Followill, as well as their cousin Matthew - have called a halt to their planned concerts in America blaming "vocal issues and exhaustion" on Caleb's part. A statement on behalf of the band said: "We are so sorry to say Kings of Leon are cancelling their entire US tour due to Caleb Followill suffering from vocal issues and exhaustion. "The band is devastated, but in order to give their fans the shows they deserve, they need to take this break. Unfortunately, the US dates cannot be rescheduled due to the band's international tour schedule." The news comes after Caleb walked off stage in Dallas, Texas, last Saturday, blaming the heat. He said: "My voice is completely 100 percent wrong. I'm sorry. "I'm gonna go backstage for a second. I'm gonna vomit. I'm gonna drink some beer ... and for the record, I'm not drunk ... I'm about to fall down here because I'm so goddamn hot. ... I'm gonna come back out here and I'm gonna play three more songs." However,he never returned to the stage with Jared revealing there was a "bigger" problem with the group. He wrote on twitter: "I love our fans so much. I know you guys aren't stupid. I can't lie. There are problems in our band bigger than not drinking enough Gatorade." According to gossip website TMZ, tickets will be refunded and the band will resume touring in Canada on September 28th.